"O Hamlet, speak no more! There are many reasons Donald Trump was elected president of the United States. Blowing up the NFL was not among them. Frankly, if you listed the targets Trump was least likely to hammer in the first year of his presidency, the NFL would have been high on that list. The guy apparently loves sports, owned a team in the old USFL and many of the present owners are either friends or donors— or both. And the NFL constituency would appear to be Trump’s electoral red meat. And yet, here we are, almost halfway through another NFL season, and the fuse lit under the league by Trump is setting off charges beneath the league’s vaunted image— The Shield, as the marketers like to call it. The money-making machine whose business model was so bullet proof that it virtually ran itself. The major TV networks in the U.S. will pay the league $39.6 billion in a contract that goes till 2022. Merchandising, logo sales, stadium deals bring in billions more. The league has survived labour stoppages, DeflateGate, CTE and much more with nary a dent on The Shield. But with a few bombastic tweets, Trump has suddenly put the league on its back foot, exposed the previous scandals anew and forced the public— at least those who don’t bet the NFL— to reconsider their allegiance to teams’ stars and the myth of the Sunday sport as an apolitical diversion. Trump re-opened an issue that the NFL’s gaffe-prone commissioner Roger Goodell thought he’d put to bed. Namely, disaffected QB Colin Kaepernick taking a knee during The Star Spangled Banner to pay lip service to the grievance agenda of Black Lives Matter. The initial uproar surrounding Kaepernick— and his current unemployment— burned brightly on social media before being subordinated by other shiny objects. Then, amidst all the fires he was stoking with Congress, the media and Hollywood, Trump unexpectedly turned his sights on NFL players taking a knee during the anthem. How dare they?, he thundered. Taking the knee was tantamount to disrespect for Old Glory. The millionaire players, their agents and media lap dogs— the usual suspects who cry “racism" when the wash goes from rinse to spin cycle— decried Trump’s insensitivity. Almost all the NFL owners, petrified of losing their star players, paid lip service to racial harmony in a league that’s over 70 percent black. Some joined hands, others took a knee. Media water carriers like Keith Olbermann and Chris Cuomo lost their minds. Why wouldn’t they complain? A pliant progressive media always gives them good wind therapy. But then a funny thing happened. 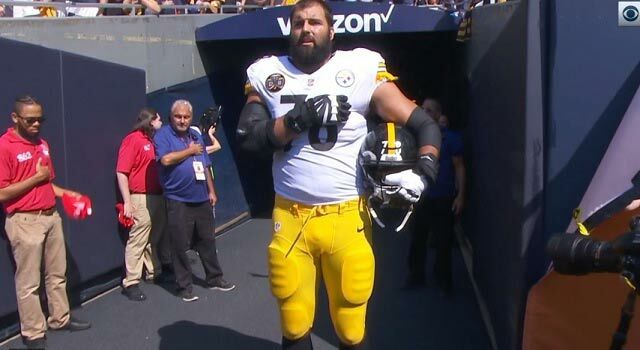 A Latino player on the Pittsburgh Steelers, Alejandro Villanueva, said 'screw this' to the team staying in its dressing room for the anthem. The former Marine stood in the tunnel to the field, hand on heart, for the Star-Spangled Banner. TV cameras found him. Instantly his became the most ordered NFL jersey in the nation. About there same time, the team’s star QB Ben Roethlisberger, who is white, said he was sorry he hadn’t joined Villanueva for the anthem. Can you get more tone deaf, more out-of-touch? The public instantly bought Trump, not Goodell’s pampered league. Fans burned jerseys, tickets, promoted boycotts, turned off their TVs. While the mainstream media whined about Trump’s dastardly behaviour, the public tuned them out. Patriotism was not a New England pun but a burning issue. Next thing you knew, Cowboys owner Jerry Jones— who’d knelt with players in Week One of the anthem controversy— was threatening to bench any players who upstaged the anthem. Other owners demanded a league-wide policy to cover their ample fannies. Goodell’s compromise went over well in the liberal silos of the coasts. But side-stepping loyalty was not an easy sell anywhere in between the coasts. In a nation where the pejorative term “white privilege” grates on tens of millions of working-class whites, putting BLM’s right to protest during work hours above the flag made Goodell’s compromise a loser. Now, the cupidity of the NFL is fair game for those late-night comedians who’ve exhausted their Trump hate. Brain injury, the corrupt college development system, the injury plague decimating the league’s stars— all are being exploited. It doesn’t help that the salary-capped NFL seems to morphing into a league where everyone finishes 8-8. Why did Trump do it? Some would simply say, “Because he can”. But for a man widely ridiculed as an idiot, Trump understands the public intuitively. Just like Hamlet, his “madness" allows him to strip away the tissue of legend from the NFL fans’ eyes where they see "such black and grainèd spots as will not leave their tinct”. POTUS 45 is about to carry out the NFL King on its Shield. And it wasn't even close.